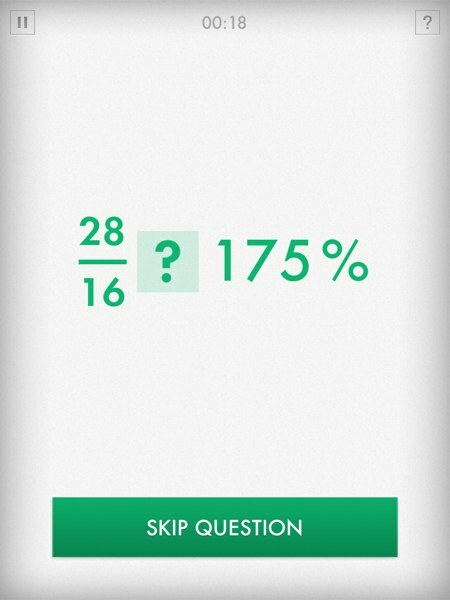 One of our favorite developers, Shiny Things, has a line of math apps intended to challenge your mental arithmetic tests. Labeled the Quick Math series, we previously wrote of their benefits for both grade school-aged kids and teenagers. 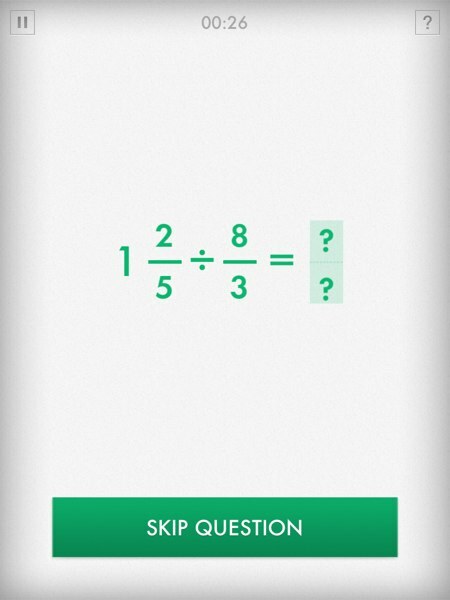 A special feature of Quick Math apps is their support for handwriting recognition, which allows players to write their answers directly on screen. Just recently, Shiny Things released a new app, Quick Fractions, that extends this feature. Now, players can write whole fractions, instead of integers, on screen. Quick Fractions has a great Tips section where you can learn a lot about the basics of fractions. Like other Quick Math apps, Quick Fractions offers four game modes. The first one is Equivalence, which focuses on finding equivalence among fractions, decimals, and percentages. For example, 3/4 = ?/40, ?/30 = 1.2, and 80/? = 160%. In the third mode, players will learn how to perform Addition and Subtraction with fractions. They will first learn the concept of finding the common denominators before adding or subtracting the numerators. They will also learn to simplify the results into mixed numerals. Once players have mastered all the other modes, they can challenge themselves with the fourth mode: Multiplication and Division. In this game mode, they will learn to multiply and divide two fractions, decimals, and/or percentages. Keep in mind that in the last two modes, players may be asked to write the fractions as a whole (for example, 11/23), instead of just any of the missing numerator or denominator. First, if the question has mixed numerals, convert them to improper fractions. Once the denominators are the same, add the numerators. At the end of the question, convert to a mixed numeral, if necessary, and simplify. Quick Fractions supports multiple user profiles, allowing parents or teachers to track the individual progress of each child. The app has four difficulty levels: beginner, intermediate, advanced, and extreme. This allows more advanced students (and even adults) to find suitable challenges for their levels. In Quick Fractions, players handwrite their answers directly on screen. The app can even recognize a fraction as a whole. If you’re helping your kids learn fractions using this app, you might want to read these tips. They will help you solve the math problems and improve your speed. The faster you complete the challenges, the bigger your chance to unlock the new avatars. Even though you can start playing with any of the game modes, I recommend working your way up from the first mode. Make sure you read the Fraction Tips in each section first. In the equivalence mode, you’re asked to find a missing component from two fractions. If it’s a missing numerator, try to find the relationships between the denominator. For example, to solve 3/4 = ?/40, start by identifying the relationship between 4 and 40. Once you do, it’s easier to solve the problem. This approach also works if the problem has a missing denominator instead. If you find a decimal or percentage in the equivalence mode, try converting it to a fraction first, then use tips #3. For example, to solve 90/? = 2.25, start by converting 2.25 into 9/4. Remember these equivalents: 0.125 = 1/8 and 0.25 = 1/4. They will come in handy when you need to mentally convert a decimal value into a fraction. Comparing two fractions, a/b ... c/d, is easier when you perform a cross multiplication and compare their results: ad ... bc. Whenever possible, try to provide a simplified result whenever possible, because this will improve your overall time. For example, solving 1/3 + 1/6 = ? into 3/6 or 9/18 will require another simplification step. You should write the final answer (i.e., 1/2) whenever possible. Throughout the game, you may need to write the fraction as a whole. If you do, stay clear from the Skip Question button, because you can hit the button by mistake. Remember that multiplying a fraction with an integer means you only need to multiply the numerator. For example, 3 * 10/10 = ? should yield 30/10, and not 30/30. Quick Fractions also accepts inequality operators, such as “<”, “=”, and “>”. Quick Fractions is a great app for kids ages 9+ to learn about fractions. They will learn how to convert fractions to decimals and/or percentages, and vice versa. They will also learn the difference between proper fractions and improper fractions, and how to convert them to and from mixed numerals. They will also learn how to perform arithmetic operations on fractions, and simplify the results. It’s a must-have for anyone learning about fractions.